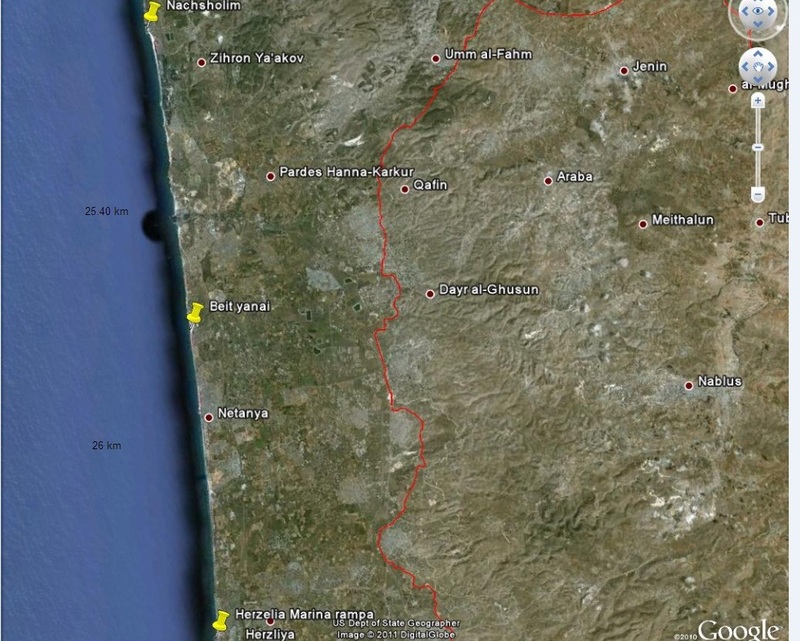 This year’s Facts and Story paddling the Israeli coast from North to South. This year Amnon first decided we’ll do this trip non-stop under 40 hours. I was not sure about that one, but I can not let him down because his wife will not let him paddle alone. After talking for a while, he decided it will be done in three days. Amnon: This is my annual Local-Patriot ritual, and I’ll keep going on doing it as long as I can. Coby: If the weather is good, I might even enjoy it. Karel: This is my annual check-up without seeing a Doctor, and I promished Amnon’s wife that I won’t let him go alone. Sergey: I like paddling, and I love challenges, this is a good combination of both. Why in three Days? We have already done it in four days, and two days are too rigorous. Weather: Started out with a light SE wind, after about two hours winds changed to Slowly to Strong SW winds averaging around 12 to 15 knots and stronger gusts. The waves started to build up to steep head waves sometimes breaking. Late afternoon: wind and seas went down to flat ,and light winds from the NW. 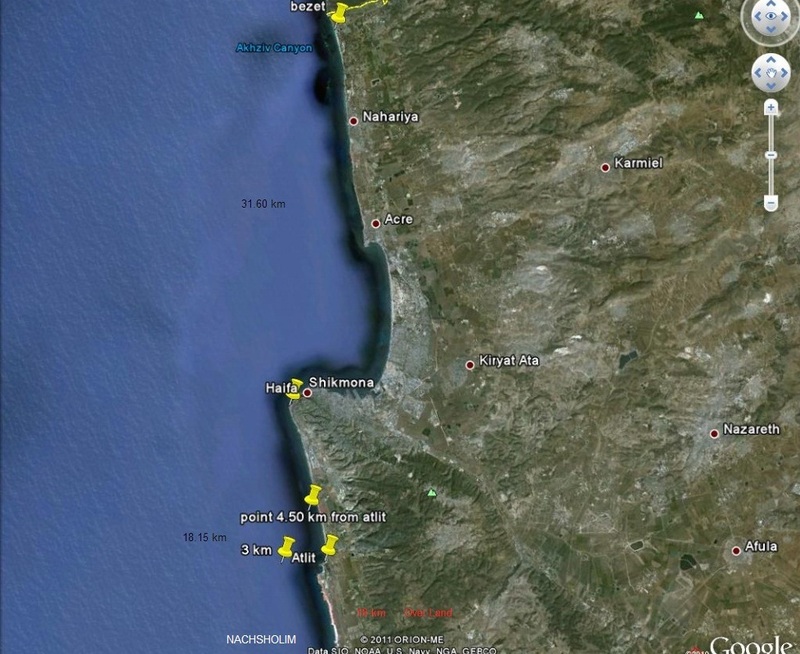 Net time on water: First leg 32 km bucking winds and waves 8 hours. Second leg 18 km around 3 1/2 hours. Weather: Morning light NW winds and building up to strong, and sea conditions from calm building up quickly with waves coming from WNW direction between 1 and 1.30 mtr. After sometime there where around 7 kayakers that wanted to paddle. A few days before everything was decided how we would transport the kayaks to the North and take them back from the South, options were to hire a truck or private cars with drivers. In the end, we did it with two drivers and two cars both two kayaks each tied on their roof racks. We decided this because 3 people dropped out and we were 4 kayakers left so transportation was not difficult to organize. We decided to meet at 3.45 am in the Herzelia Marina to load the kayaks on the roof racks, our drivers Amir Nadel and Moshe. 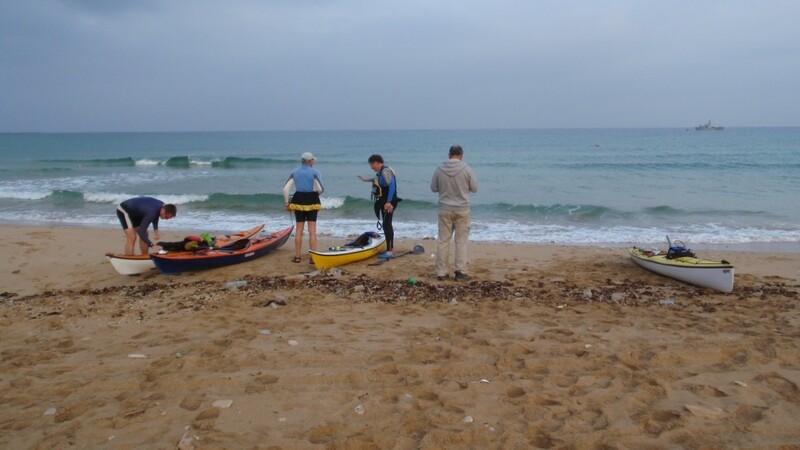 After a while when everything was checked tied down etc., we headed north approaching Haifa we decided to cut through the new tunnel which saves a lot of time and red lights, we quickly reached Bezet beach and started unloading the kayaks. Around 6:30 am we were ready and started heading in SW direction. 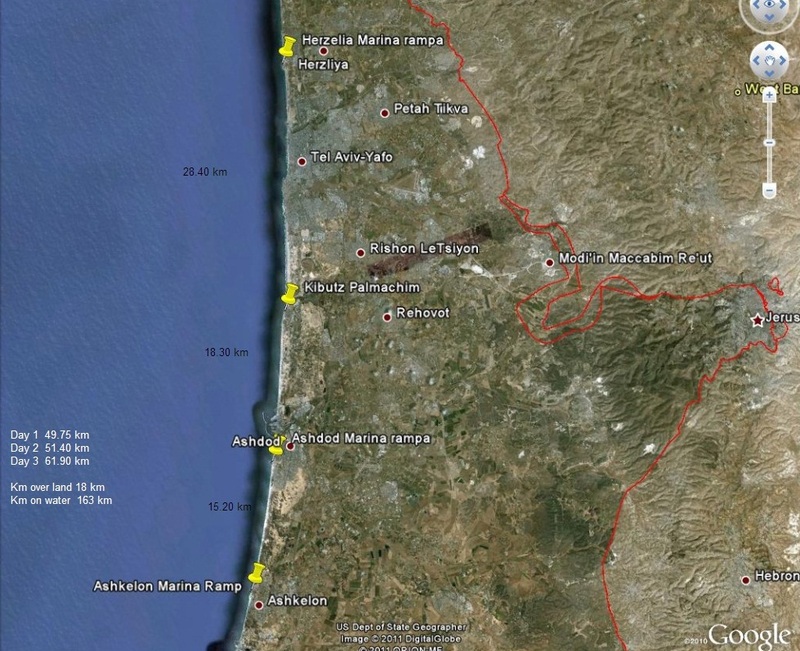 The plan was to head in a straight line to Shikmona (Haifa), the distance 32 km in normal conditions around 5 to 6 hours. 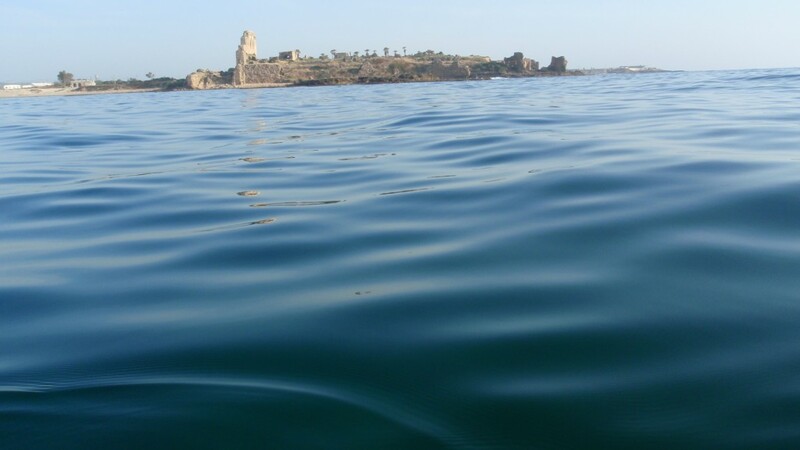 But this was not the case, we started out good with some light SE winds, which turned to south and after a few hours to the SW, picking up to around 12 knots and gusts around 17 knots, the seas quickly build up and became dumping waves from the WSW. In the end it took us 8 hours to get to Shikmona, where we took a well deserved break and refueled our bodies. From there we headed south along the coast line, the seas were calming down with light winds from W to WNW seas also flattend quickly.About 4.5 km before Atlit we started to distance away from the shore in SW direction,this was because we can not paddle in a restricted area used by the Navy for excersize the distance is around 5.5 km of shore before its allowed to head south.Meanwhile around 3 km + offshore zodiacs arrived and told us to paddle to the beach ,they were having a big Navy exercise soon and they were sorry ,they got orders not to let anyone through on this day.So no choice we paddled back to the beach.Every year we have taken tents with us ,the problem now was that we had ordered a room around 12 km down the coast so we had to find a solution to get there with kayaks and gear.we talk to a guy on the beach who was willing to take us for a small fee,he had an old car with a roof rack for two kayaks so he had to drive twice which he agreed ,so thanks Yakov we appreciated it.After a while all of had arrived and we had dinner etc. The following day we took our Kayaks on lugguage cartsand transported our kayaks and gear to the beach,We took to the water heading in SSW direction away from the shore with Ne winds and flat seas after a while the winds died out and we continued south,we got to Beit Yanai beach around 10:30 where we took around an hour break.After a short while 4 bicycles arrived and they told us they were peddling across Israel from the North to the South every weekend they peddled as far as they get.We then headed south again destination Herzelia Marina where we arrived around 1530.Kobi decided to continue to Tel Aviv and would meet us in the morning around 0630 on the water,after storing the kayaks there for the night we all headed home for the night. The third and last day we got to Herzelia Marina at 0500 and were on the water at 0530 heading towards Tel aviv where Kobi was waiting for us on the water West of the Yarkon river mouth.After he joined us we headed towards Yafo,passing the old city’ s Harbour ,we could see Bat yam after that Rishon we decided to take a break at Kibutz Palmachim around 28km from our starting point. After arriving there and meeting Rafi again we headed towards Ashdod Harbour the seas and wind where picking up winds from the NW and seas from WNW direction,just before we reached Ashdod Harbour entrance a big container ship was entering the Harbour,crossing the Harbour entrance took a while being hit with waves from the side ,after the crossing of the Harbour entrance we decided to take another break at Ashdod Marina before heading towards our final destination .While we were taking a break and were about ready to go ,we ran into a small problem there was a sailboat race (small skiffs and lasers around 500 them) which has just ended all of them were coming into the launch ramp at once. all of us arrived satisfied. Amir and Moshe our drivers joined us for Chips, Humus and Beer,we’ll see what the next trip will be? This entry was posted on Saturday, June 4th, 2011 at 11:12 and is filed under Weather. You can follow any responses to this entry through the RSS 2.0 feed. You can leave a response, or trackback from your own site.